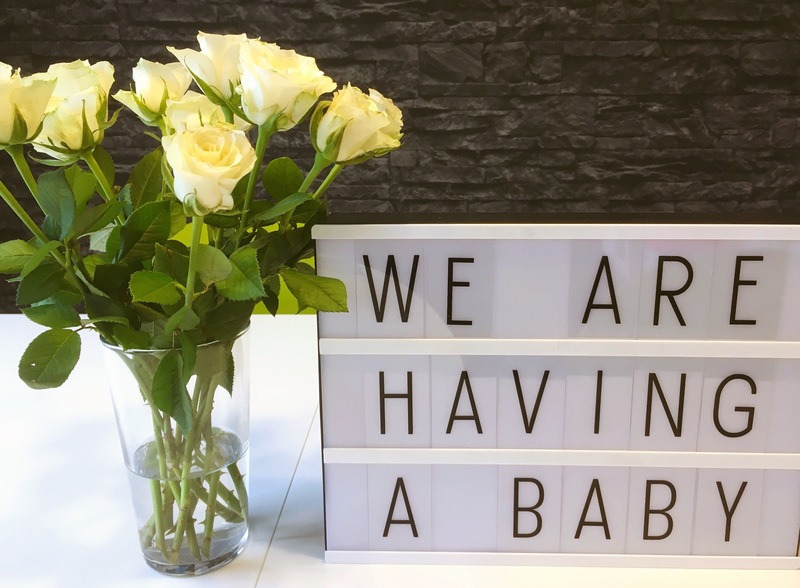 So, it&apos;s time for a huge announcement….. we are expecting baby number 7!!!! Yes, we are a little bit mad (as everyone keeps telling us) but we couldn&apos;t be any more excited! I am currently 16 weeks, feeling really well and we are really looking forward to our new arrival in early July. Deciding to have another was a gradual process, we had honestly thought Freya would be my last (and Dave&apos;s first and last!) But as time crept on we both admitted we felt like we could have &apos;just one more&apos;. Being the grand old age of 42, I couldn&apos;t be certain if it would even happen and we decided to just stop contraception and see what happened. Fast forward to six weeks later, we were on holiday in Littlehampton and it was Nathan&apos;s graduation day. My period was not due for 5 days but for some reason I decided I&apos;d do a pregnancy test anyway, fully expecting a negative result (only people who have been through the whole trying to conceive experience can understand why I would feel compelled to pee on a stick even though I was sure I wouldn&apos;t get an answer – in short, trying to conceive sends you a bit bonkers). After a few seconds of staring at a blank test I saw two lines appear – what?? Was I actually pregnant?? After another moment or two, it was clear I was actually pregnant as the two lines were bold and unmistakable. Wow, this was really happening. I hadn&apos;t mentioned to Mr T that I was going to take a test, I thought it was pointless to get his hopes up, but now I had to decide how to break the good news to him. I knew I wouldn&apos;t be able to keep it a secret for more than a very short time and nor did I want to, but I didn&apos;t just want to go downstairs and show him the test either. We were heading out on an early morning walk along the beach, so I decided that I would somehow tell him at the beach. I still didn&apos;t have a plan but then on the beach just as we were taking a selfie I said "Guess what? I&apos;m pregnant!" and managed to capture in the photo the exact moment he found out he was going to be a dad again. As you can see, he was a little shocked, but lots of happy tears, hugs and kisses followed immediately! We decided to keep it to ourselves for a while, this was easier said than done as by week 5 sickness was kicking in, and not long after that I started to show. I was also beyond exhausted in those early few weeks and frankly felt like absolute crap all of the time! Mr T was amazing in looking after me and helping me keep more or less on top of things and we muddled through (especially as the weeks I felt at my absolute worst coincided with Mr T&apos;s dad being rushed to hospital and us having no kitchen at home!) But somehow we kept the secret! We had an early private scan at 6 weeks just to check all was well (it was, and it was fabulous seeing and hearing a heartbeat at such an early stage) and we also decided that as I was higher risk of chromosome abnormalities due to my age we would have a private NIPT at 10 weeks (non-invasive prenatal testing) which meant taking some blood from me, sending it to America and they would find the baby&apos;s DNA in my blood and check the chromosomes – isn&apos;t science just bloody amazing? The wait for results was an agonising 11 days but finally on the last morning of our holiday in the week before christmas we had a call from the clinic to say everything was absolutely fine, I was super low risk and also we were able to find out the gender. We were absolutely thrilled and obviously hugely relieved. In the end we broke the news to our families two weeks before christmas. It might have seemed the obvious choice to wait until christmas day but there were a couple of reasons why we wanted to say something before – we didn&apos;t want to shift the focus from the little ones at christmas, and we also didn&apos;t expect Milly to be thrilled about the news (she wasn&apos;t, but she soon got used to it) plus it was getting harder and harder to hide! Mr T&apos;s parents were surprised but very excited and there were a few happy tears from all of us, my parents somehow had an inkling that I might be so weren&apos;t too surprised, Nathan had guessed already (as I went to tell him, he said &apos;yeah, you&apos;re pregnant, I guessed&apos;), Matty and Jess were both very surprised but pleased and Milly was less than impressed initially but soon fine. Sienna was very happy and excited and is really looking forward to being a big sister again and although Freya is a little too young to understand she was happy because everyone else was happy! 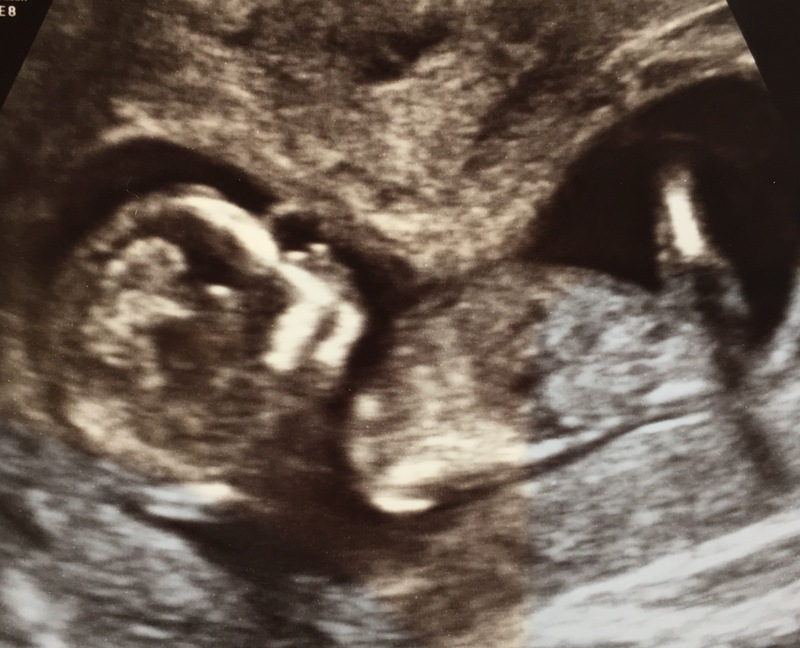 My dating scan was between christmas and new year and showed me just a few days further along than expected and even though this is my 7th baby I am always in awe of the fact that after such a short time of developing there is a fully formed baby inside! The scan was particularly clear, we could count fingers and toes (seriously, the baby was only 7cm long at this point, how tiny were those little toes!) and see it swallowing, waving and moving around. Even though I have done this a few times already I am so fascinated and amazed. Of course we must be a little bit mad, but although this baby is number 7 it is one of 3 little ones, the other 4 are almost independent adults (well, most of the time!) Yes we will make our already busy household even busier but we are fine with that. One more baby in our circus is very welcome. Some might consider 42 to be too old to be pregnant but to be honest I just think my age is a bit of a non issue. Yes I will be no doubt be induced at my due date in line with my hospital&apos;s policy for mums over 40. Yes I will be under consultant care. I will take all the medical advice and follow it because it would feel a bit reckless not to. I am certain that I can have a straightforward healthy pregnancy. At 16 weeks I am feeling pretty good, this is undoubtably the best bit of pregnancy. The sickness and tiredness have both eased and I feel more or less normal (whatever that is!) I haven&apos;t really felt the baby moving yet but hopefully that will be in the next week or two. Sienna keeps kissing my bump and talking to the baby and asking when it will come out, Freya will point at my tummy and say &apos;Baby&apos; while the older kids want to know what we call it and Mr T is just busy doing a fabulous job of taking care of us (as always). Tags: 16 weeks pregnant, 7th baby, Pregnancy, pregnant at 42. Bookmark the permalink.